Optoma is a brand name that has always been associated with premium quality home cinema projectors. The company has finally released one of its best multimedia projector with future ready technology and high-end hardware. The premium quality Optoma EH500 has got eyebrow raising specification which will surely upset its rivals. We were keen to know if this full 3D multimedia projector was worth its price tag despite impressive specifications. We got a chance to play around with the Optoma EH500 review unit and investigate if it’s worth a buy. The model comes with incredible 4700 lumens powerful brightness and native 1080p Full HD resolution. The brilliant brightness with amazing contrast ratio of 10,000:1 offers quite natural and vivid colors. Having used the device for few days and played variety of movies, presentation slides and video clips, we were really impressed with its projection quality. The projector brings incredible movie watching experience, thanks to top-notch hardware under the hood, Optoma’s experience in this domain and latest technologies integrated inside. Images, text and videos appear extremely crisp and sharp with vibrant colors. The Optoma EH500 is well suited for large screen home cinema setups. What makes this multimedia projector brilliant is its ability to produce vibrant colors in incredible details. The model uses Texas Instrument’s DLP with BrillianColor technology for multicolor processing. We must point out that the on-screen display quality was something we never experienced with other low cost projectors. By virtue of its amazing projection quality, we spend lot more time in watching 1080p HD movies than we normally would do with a multimedia projector. The company claims that the lamp is rated to last up to 2500 hrs in standard mode and 3500 hrs in economy mode. Speaking of connectivity options, the Optoma EH500 has complete array of it. The future ready model comes with 2xHDMI input ports, 2xVGA input, one VGA out, 1xUSB input to playback from flash drives, S-video and composite video ports, Stereo input & output, RJ45, 12V out, RS-232C and 3D VeSA port. The other thing you notice about this model is its premium design, the device looks superior elegant. As expected for this price tag, the material used for the construction feels strong and durable. The Optoma EH500 comes with a hefty price tag, but considering the amazing movie watching experience it offered, we feel the model is worth every cent. 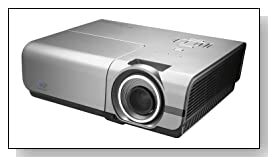 We think the company has priced the projector quite competitively given its top-of-the-line hardware and technologies. However, we can suggest few other models at comparatively low price but the experience with this device is truly unrivaled. If the price tag doesn’t deter you, it is certainly one of the best full HD multimedia projector in the market today. If you’re on tight budget, we recommend to consider buying Optoma HD131XW, which we reviewed earlier.